This is one of several suburban branches of the Savings Bank of Glasgow, built on important corner sites and endowed with landmark towers. 1 It achieves the scale necessary for its prominent site by combining the single-storey domed banking hall with a block of tenement flats above shops. 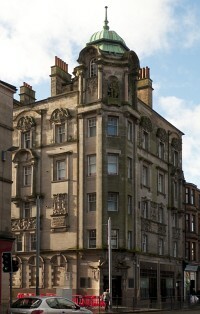 The baroque design draws heavily on John Honeyman & Keppie's unsuccessful competition entry of 1894–5 for the Royal Insurance Company offices in Buchanan Street, on which Mackintosh worked. The tower in particular is very close to the earlier design. Authorship: John Keppie was personally appointed architect for the Parkhead branch by the Committee of Management of the Savings Bank of Glasgow. 2 He submitted reports and attended meetings, the bank corresponded directly with him, and there is no doubt that he was responsible for the building. 3 The drawings approved by the Dean of Guild Court are naturally signed with the practice's name rather than Keppie's, but surprisingly the signature is in Mackintosh's hand. 4 However, there is no evidence that Mackintosh contributed to the design. 1: Fiona Sinclair, 'North, South, East and West: A Process of Banking Patronage', Charles Rennie Mackintosh Society Newsletter, 44, Autumn 1986, pp. 5–8. 2: University of Glasgow Archive Services: Savings Bank of Glasgow records, Minute Book 8, GB0248 TSB 63 1/1/8. 3: University of Glasgow Archive Services: Savings Bank of Glasgow records, letters books, GB0248 TSB 63 1/11/28, GB0248 TSB 63 1/11/29, GB0248 TSB 63 1/11/30. 4: At least one other drawing signed by Honeyman, Keppie & Mackintosh was in the possession of the then owner of the building in 2004: The Hunterian, University of Glasgow: unidentified press cutting.